Whether it’s driven by an urge to eat fresh, local, seasonal produce or an interest in finding plants for their medicinal and spiritual qualities, every year more people discover a love of foraging. And now with Gather, they can record their experience: where they found specific plants, when they found them, and personal reminders and tips for their next expedition. Gather features three sections - blank monthly calendars, record pages where foragers can make specific notes on the plants they found, and fillable maps where users can document their favorite sites. Black and white illustrations throughout by Maggie Enterrios make Gather a beautiful, inspiring object that foragers will treasure. 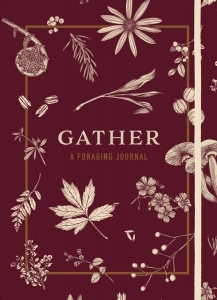 This illustrated journal allows foragers to record how they collect and use their favourite wild plants, while creative prompts help them to reflect on living a more natural life.